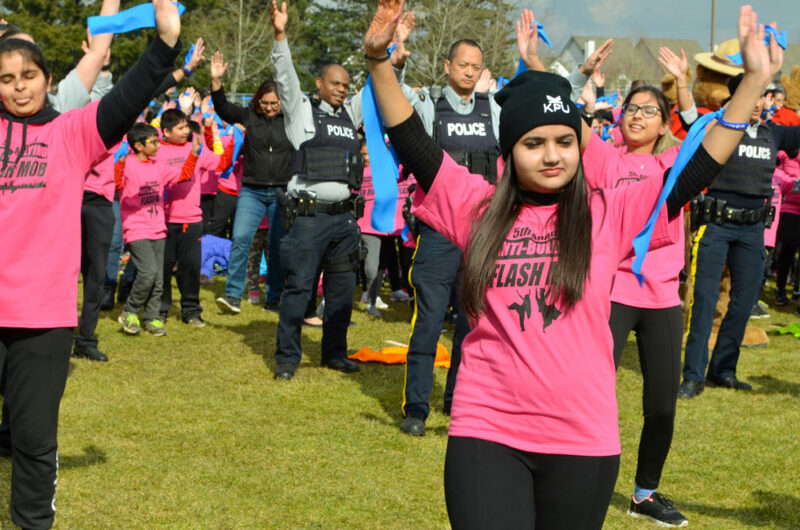 The KPU Bhangra team led students from several other schools, as well as officers from the RCMP, in an Anti-Bullying Day flash mob on the lower field of Tamanawis Secondary on March 14. More than 1,300 students from KPU, Beaver Creek Elementary, Boundary Park Elementary, Cougar Creek Elementary, J.T. Brown Elementary, and Martha Jane Norris Elementary flooded onto the grass wearing their pink shirts to participate in the event. Community members also came out to encourage the students with anti-bullying signs, pink shirts, and big smiles. This year’s flash mob was the fifth anniversary of the event directed by Sean Bindra. Bindra is not part of any collective or organization, but is hoping to inspire change through community activism and the celebration of culture. Members of the RCMP were there in uniform, but that didn’t stop them from getting in on the fun. She adds that role models who have had experiences with bullying should speak out against it on behalf of Surrey youth. For the first time in the event’s history, the flash mob’s Bhangra dance was choreographed by Gurpreet Singh from the South Asian Arts Society. Singh worked with the KPU Bhangra club on the dance and visited elementary schools in the weeks prior to help lay the groundwork for an event of this scale and to teach students the steps. The Bhangra-western fusion style of the dance was inspired by the residents of Surrey and North Delta, many of whom are of South Asian descent. The intention behind this was to give participants the opportunity to celebrate diversity while working towards a common goal; to fight bullying and, of course, to be a successful flash mob. While flash mobs and choreographed dancing events do not have the power to single-handedly stop bullying, taking part in a lighthearted, low-pressure activity with more than a thousand other people has the potential to lift one’s spirits and make people feel a little less alone. Bullying is a tragically common experience that almost everybody has encountered in some form, and having such a wide variety of supporters show up to take a stand against it at a local high school is certainly a step in the right direction.